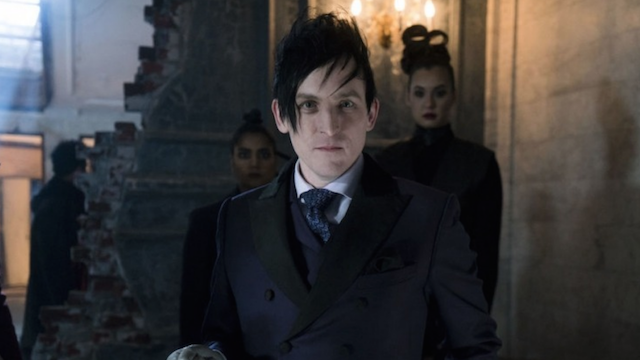 In Gotham season 5 episode 4, Gordon and Penguin team up to find the Haven Bomber, Selina tracks down Jeremiah, and Nygma’s motives are finally revealed. In the aftermath of the Haven attack. Barbara once again tries to shoot Penguin. However, she can’t bring herself to do it amidst the carnage. 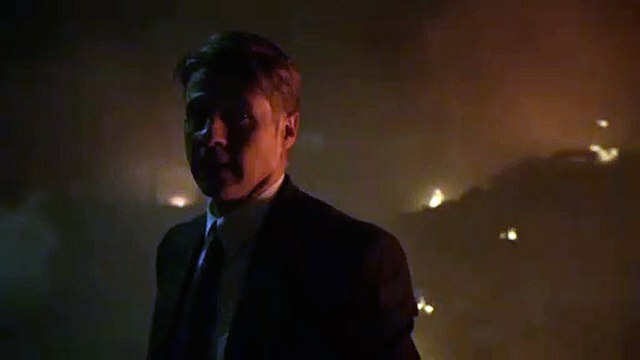 Gordon then confronts Penguin, blaming him for the attack. Later, Gordon learns that the child he gave his badge to died in the bombing. Gordon yet again reaches out for assistance, but a mob of angry citizens petitions for Gordon to do something about finding the culprit. He enlists Lucius to find clues while he and Bullock suspect Barbara was behind the bombing. At Barbara’s HQ, Gordon confronts her. She gives him a potential lead on the bomber’s location, before Bullock calls Gordon back to GCPD. Penguin arrives offering weapons and a truce to put their differences aside in order to catch the bomber. Penguin lost people in the bombing, and he too wants his revenge. Penguin convenes a Kangaroo court, where Gordon reveals the reason why Zsasz is innocent. After another one of Gordon’s impassioned speeches to the court, they decide to convict Zsasz anyway. When he is brought to the chopping block, Gordon and Bullock intervene, much to Penguin’s dismay. Later, Gordon and Bullock let Zsasz go somewhere in the city, saying that he’ll “see him around.” Back at GCPD, Barbara visits Gordon with another tip on someone who is selling RPG’s. Barbara seduces him, and the two kiss in his office. Bruce was still chained to the metal grate where Selina left him. Random thugs attack Bruce before Alfred arrives in the knick of time. Bruce wants to follow Selina and Alfred agrees to help find her. Selina tails Harley and Jeremiah’s new followers, which leads her to Sykes and the Soothsayers. Jeremiah, who is seemingly behind the child labor effort, eventually murders Skyes with a switchblade. Harley brings all of the recruits to Jeremiah, and she also tells him about her confrontation with Bruce and Selina. Later, Bruce and Alfred attack some of the new recruits. At the same time, Selina attacks Jeremiah, stabbing him directly in the gut multiple times. Bruce finds Selina, and a fight ensues around the presumably dead Jeremiah. Nygma once again wakes up not knowing what he did previously. He left himself a message on his hand that leads him to seek out inmate records for Blackgate prison. He infiltrates the GCPD records in disguise, but he is caught by Lucius; who offers the information in exchange for help discovering who bombed Haven. Riddler reluctantly agrees. Nygma and Lucius inspect the bombsite, and the former suggests that the building itself was the bomb, and that it was ignited from an incoming RPG form somewhere outside. On a rooftop across the street from Haven, Lucius and Nygma find an empty RPG case. The duo part ways, and Nygma gets his file. Upon inspecting it, he learns that the inmate is deceased, before noticing an old lady in apartment across the street that might know more. 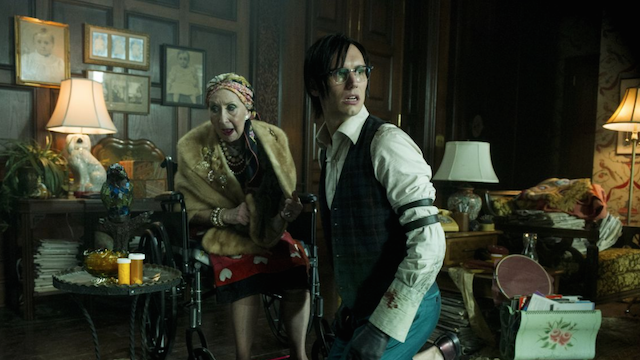 Nygma investigates the apartment with the old lady, which corresponds to the numbers found on his arm. 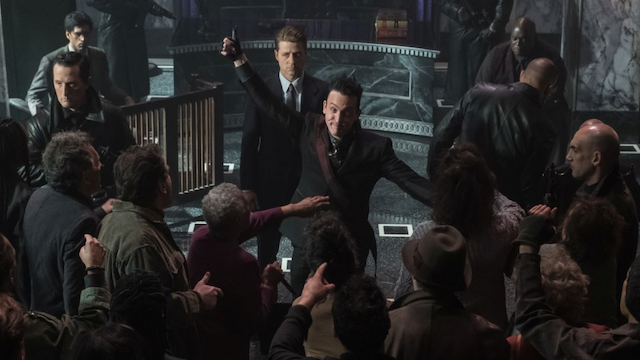 The woman asks Nygma not to hurt her and reveals that he was the one who fired the rocket. After Nygma realizes the truth, he throws the woman out of the window. 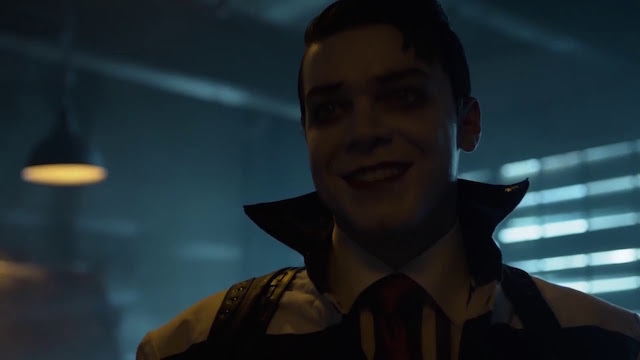 What do you think about Gotham season 5 episode 4? Let us know in the comment section below!